The Jack London Square Farmers Market takes place in Jack London Square at Webster Street at Embarcadero West, in the plaza that contains Jack London’s Cabin (aka “Palm Plaza”). CUESA offers validation at the Washington Street Garage (101 Washington) for farmers market shoppers, making your first hour just $.75. Stop by the CUESA Info Booth on Sundays (10 am to 3 pm) for validation. What market services does CUESA offer? Can I use my credit card at the farmers market? An ATM is located by the parking lot adjacent to the plaza at Broadway and Water Street. Can I use my EBT card or WIC vouchers in the market? What is Market Match? CUESA’s farmers markets accepts EBT (CalFresh/food stamps). During market hours, customers can use their EBT card at the CUESA Info Booth to receive market coins. WIC (Women, Infants, and Children) and Farmers Market Nutrition Program vouchers must be redeemed directly at participating sellers’ stalls. EBT shoppers can double their dollars up to $10 per market day through the Market Match program, which offers tokens redeemable in the market for fresh fruits and vegetables. Why aren’t dogs allowed at the farmers market? California Health & Safety Code 114259.5 stipulates that live animals aren’t allowed in certified farmers markets and permitted food facilities, with the exception of service animals. Fraudulently misrepresenting service animals is a misdemeanor (California Penal Code 365.7 [a]). Please make plans to leave your animal at home or at a safe place outside of the market. How can I get involved as a volunteer at the farmers market? Thank you so much for your interest and support! Volunteers are vital members of our team who perform a wide range of duties such as assisting customers at our farmers markets and supporting our education programs. Learn more about volunteering here, or contact cindy@cuesa.org. I represent a local nonprofit. Can I table at the farmers market? 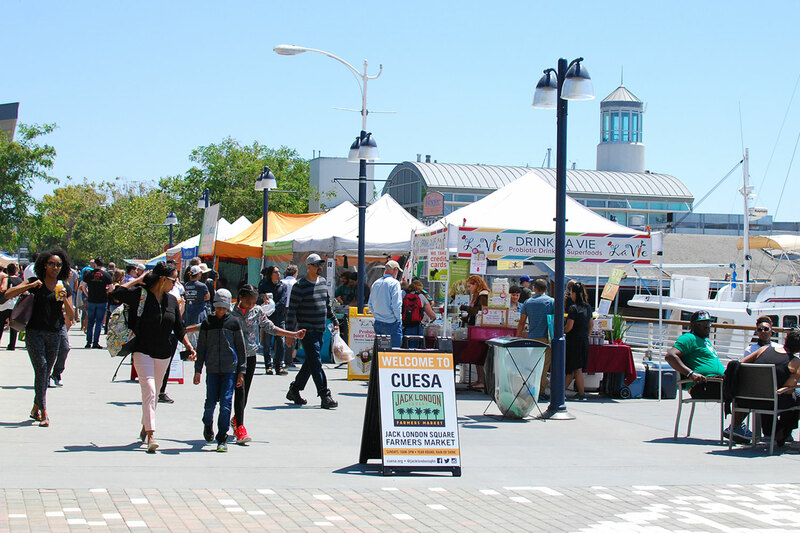 In stewardship of the Jack London Square Farmers Market as a local community space, CUESA welcomes mission-aligned local nonprofit organizations to share their work with our market community, free of charge. For more information, please contact us at jlsfm@cuesa.org. I am a local musician. Can I play music at the farmers market? CUESA manages live music at the Jack London Square Farmers Market. If you are interested in performing, please contact us at jlsfm@cuesa.org. Does CUESA offer sponsorship opportunities for companies in the farmers market? I have more questions. Who should I reach out to? We invited your questions and input! Please feel free to contact us at jlsfm@cuesa.org or 415.291.3276.